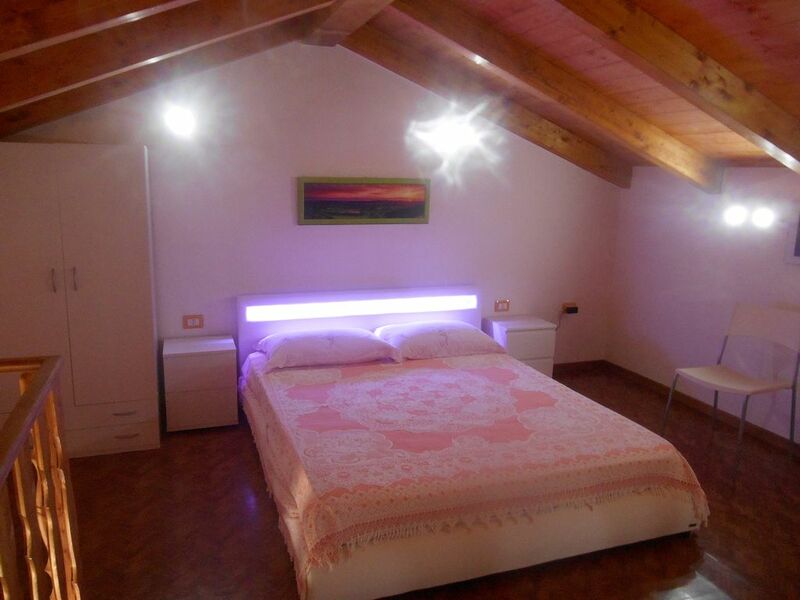 Casa Ornella is a very nice and new studio loft thermo. The house is situated in Nebida, the pearl of the south-west coast of Sardinia. The loft is equipped with every comfort and designed to meet and satisfy the needs of tourists. The loft is about 50 square meters (max 4 people) with kitchen-living room with sofa bed, bathroom with shower and a loft where you can walk comfortably in an upright position (H. max 210 cm) with a friendly and cheerful bed to single or multicolor LEDs controlled with a simple remote control. The house has a courtyard and veranda with table and chairs for outside eating. E 'can use our barbecue to prepare and enjoy your roasts. The house is equipped with every comfort: emergency lights, washing machine, LED TV, free wi-fi, microwave, first aid kits, smoke alarm, iron and ironing board, hair dryer, barbecue, courtyard with veranda and adjacent parking spaces building. For your holidays in Sardinia on the sea we provide a modern facility with two nice and comfortable apartments. The houses are located in Nebida, the pearl of the south-west coast of Sardinia. Live the best holidays and great prices. The LOFT HOUSE LAMARMORA ORNELLA and are equipped with every comfort and specially designed to meet and satisfy the needs of tourists with the presence of a washing machine, LED TV, free wi-fi, microwave, iron and ironing board, hair dryer, first aid kit , smoke detectors, barbecue and free parking spaces adjacent to the building. The Ornella loft is a loft thermo about 50 square meters (max 4 people) with kitchen-living room with sofa bed, bathroom with shower and a loft where you can walk in comodomante upright position (H. max 210 cm) with sympathetic and cheerful double to single or multicolor LEDs controlled with a simple remote control. The house has a courtyard and veranda with table and chairs for outside eating. E 'can use our barbecue to prepare and enjoy your roasts. The house is a LAMARMORA pentavano thermo about 100 square meters (max 7 persons + baby) with a large kitchen with veranda overlooking the sea, living room, three bedrooms and two bathrooms with showers. In the veranda there are tables and chairs to eat outside and enjoy the beautiful sunset. E 'can also use the barbecue facilities to prepare and enjoy your roasts. The building is located in the center of the country, about 50 meters from the main square and the famous Belvedere, but in a private location so as to be absolutely silent. The main services are all within a few dozen meters: bar, butcher, delicatessen, supermarket, pharmacy, doctor, church, Italian post office, police, pizzerias and restaurants. In addition, the house is located between two of the ARST bus stops connecting to the city of Iglesias Nebida. Do not miss the opportunity to spend the holidays in this beautiful location that is reflected in the clear waters of the Gulf of Lion, embellished with five stacks that rise imposing make it unique this corner of Sardinia. Costs vary according to season, number of people and nights accommodation. We had a fantastic stay in Nebida. Francesco was a great host, very welcoming and offered useful information about the local area. The apartment was very nice and well equipped with everything that you would want. We really enjoyed exploring Nebida and the surrounding area and would recommend both the area and this apartment. Adrian e Elsie sono stati molto gentili, simpatici ed educati. E' stato un vero piacere conoscerli e spero di riaverli come ospiti nei prossimi anni. Premier voyage en Sardaigne, nous avions choisi la région de Nebida au hasard et avons été enchantés. La côte est superbe, beaucoup de visites sont possibles au départ de Nebida. Quant à la location, c'était parfait. Francesco est un propriétaire charmant et extrêmement réactif, le tout avec un grand sourire et un grand sens de l'accueil. La maison est toute simple et très bien équipée, d'une grande propreté. Bref, je recommande vivement le loft Ornella!! The house is perfect. It's subtly stylish and classic with modern air conditioning, tv, wi-fi and bed with LED. It's well equipped but simple enough to not feel like you're living in someone else's home. We've already booked to come back next year! In the Gulf of Lions, along the scenic coast of Nebida overlooking the sea, with beaches and coves, in the middle of the park for Geo Sulcis, you can find a glimpse of the real Sardinia rich in history (ranging from archeology to the Neolithic the industry of abandoned mines) with some of the most picturesque landscapes typical of the Mediterranean. From Fontanamare Masua, Nebida through, looking for white beaches, blue sea and tunnels dug into the earth: a journey to find a corner of Sardinia, and the Sulcis in particular, to find out in a succession of landscapes and testimonies from different historical periods.